Paperboard Packaging Market size was valued over USD 130 billion in 2016 and the industry will grow by a CAGR of more than 7.5% up to 2024. Packaging plays a significant role in the product as its aesthetic effects grab the attention of customers and thus helps increase sales. Packaging industry is growing at an exponential rate in the developed and developing countries owing to the rising purchase parity. Round the clock working lifestyles, increased income levels, and e-commerce are further fueling the paperboard packaging market demand. Rapidly growing sustainable packaging for environmental conservation and reducing the ecological footprints will propel the market owing to its less environmental impacts. Cosmetic industry is one of the prominent drivers for the paperboard packaging market. People in the developing countries are getting aware and understanding the importance of personal care and self-grooming. Use of cosmetics for self-grooming helps increase self-esteem, look and feel more confident in the corporate world. It also helps in developing one’s appearance and feel more comfortable. Increasing use of cosmetics in the developing and developed countries and growing replacement of plastic packaging products will boost the market in these regions. Plastics are replacing paperboard packaging gradually due to its cost effective, durable and superior properties. One of the major restraints for the paperboard packaging market in the food & beverages industry is the use of recycled waste paper. Due to the food packaging standards and laws, use of recycled waste paper for the packaging of food items is prohibited for maintaining the food safety grades and standards. The food & beverages segment holds a major share in the market and decreasing use of recycled paper in this industry may act as a restraint for the product market in coming years. 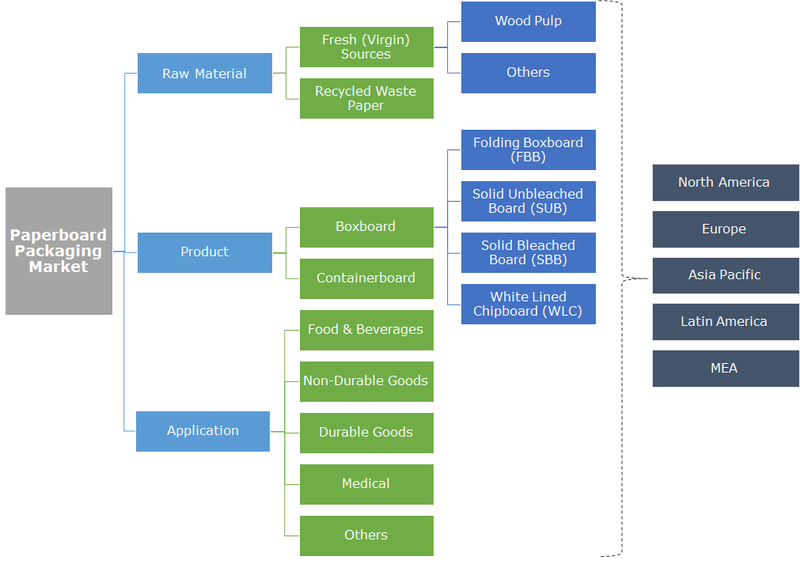 Paperboard packaging market is bifurcated on the basis of raw material as fresh (virgin) sources and recycled waste paper. In fresh sources, around 90% of the fresh paper is produced from wood pulp. Due to the increasing health, regulatory and environmental issues, paperboard packaging is receiving huge importance in many countries. Governments of different countries and world organizations are setting standards for the paperboard manufacturing and recycling to conserve the environment. Used for waste paper undergoes different processes such as collecting and sorting for the further recycling processes. This paper is mixed with virgin fibers for the production of new materials and to enhance their properties as materials made from recycled paper have inferior functional properties than the superior fresh fiber-based boards. Due to government backing for recycling of paper and environment conservation, the segment will see new growth opportunities in the coming years. Paperboard packaging market is segmented on the basis of product in two broad categories, containerboard and boxboard. Boxboard are popularly known as carton-board and are rigid in nature. The boxboard segment is further sub-divided as folding boxboard, solid unbleached board, solid bleached board, and white lined chipboard. The folding boxboard or FBB grade is manufactured with multiple layers of mechanical pulp and chemicals. The major end user industries for FBB are cigarettes, pharmaceuticals, confectionaries, frozen foods, and beauty products. Containerboard is commonly known as corrugated case material used for corrugated board production. Containerboard are mainly formed from wood fibers that are natural and unbleached. This causes them to possess different shades of brown color depending on the wood type, pulping process, and the impurity content. The segment held a significant share in excess of USD 90 billion in the global paperboard packaging market in 2016 and will grow with a lucrative CAGR in the forecast timespan. On the basis of application, the product market is classified into four major segments mainly, food & beverages, durable goods, non-durable goods, and medical. Apart from this, the product also finds application in industrial goods and machinery which are included in others segment. Food & beverages is one of the major industries for the use of paperboard packaging and held around 40% of the entire paperboard packaging market. Durable goods segment includes electronics, furniture, etc. and holds a notable share in the global paperboard packaging market. The medical segment will grow at around 4.5% CAGR in the next seven years to occupy around 7% market share by the end of 2024. Non-durable goods include non-food items such as FMCG products, cosmetics, cigarettes, etc. Geographically, Asia Pacific holds a major chunk in the global paperboard packaging market. Emerging food & beverages, electronics, FMCG, and pharmaceutical industry due to economic development will fuel the market demand in near future. Rising income level and round the clock working culture, coupled with the technological development in the pharmaceutical industry is another factor affecting the paperboard packaging. The region will grow at an exponential rate of over 6.5% in the forecast spell. 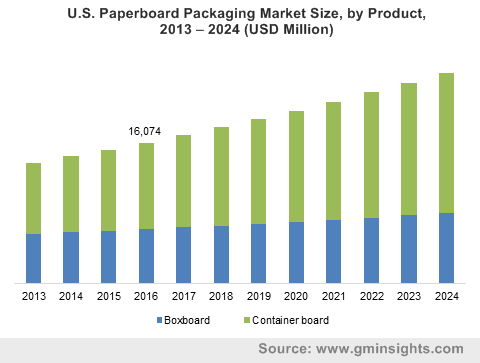 North America will display a sluggish growth in global paperboard packaging market owing to the matured market in this region. In 2016 the segment accounted for around 15% of the entire aging market. European region will grow at a moderate and steady pace owing to the paper recycling regulations imposed by the government. The segment accounted for over USD 40 billion in the global market. Prominent players operating in the global paperboard packaging market include Nippon Paper Industries, Mondi plc, ITC Limited, International Paper Company, Metsä Group, Oji Holding Corporation, Rock-Tenn Company, Stora Enso Oyj, South African Pulp & Paper Industries Limited (Sappi Limited), Shandong Bohui Paper, Smurfit Kappa Group, Svenska Cellulosa Aktiebolaget (SCA), Outlook Group LLC, Southern Champion Tray, and Badger Paperboard, Inc. to name a few. These companies have their product applications in various industries such as cosmetics, food & beverages, FMCG products, electronics, and others. Metsä Group provides folding boxboards of different quality for different product standards and applications. For example, the company’s product categories are divided into natural, classic, pro, and prime. The natural products provide a natural look, whereas the classic category provides reliable performance suitable for the FMCG products. The pro category provides brightness & smoothness for packaging high value products whereas the prime is suitable for premium high-end world-class brands. Paperboard packaging industry will foresee significant growth in the coming years owing to the recycling nature of the products and its light weight. Plastic, due to its environmental hazards is being replaced with eco-friendly and recyclable paperboard packaging. Governments of various nations have initiated certain rules for the recycling of paperboard and use of environmental friendly products. This in turn will drive the global paperboard packaging market in future years.